I’m sorry Winter’s Bone didn’t take home any Oscars last night. It is a wonderful film. 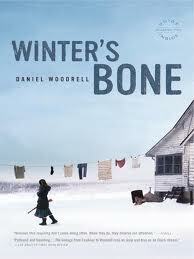 The book the film was adapted from, Winter’s Bone by Daniel Woodrell, is equally wonderful. Ree Dolly’s father is due for a court hearing and he has signed over the family home as bond. Now he’s missing, and the cops tell his sixteen-year old daughter that their home is forfeit if he doesn’t show. Ree, sole support and care-giver of a mother who has slipped her leash on sanity and her two young brothers, sets out to find him among the meth dealers of the backwoods Ozarks. Every man and woman’s – and even the weather’s – hand is against her. The characters live and breathe, as does the landscape, and the plot is only a cliche because it has worked every single time since Snidely Whiplash evicted Pauline. What moves me most is the language. Here are some samples. Ree nearly fell but would not let it happen in front of the law. She heard thunder clapping between her ears and Beelzebub scratchin’ a fiddle. The boys and her and Mom would be dogs in the fields without this house. They would be dogs in the fields with Beelzebub scratchin’ out tunes and the boys’d have a hard hard shove toward unrelenting meanness and the roasting shed and she’d be stuck alongside them ’til steel door clanged shut and the flames rose. She’d never get away from her family as planned, off to the U.S. Army, where you got to travel with a gun and they made everybody help keep things clean. She’d never have only her own concerns to tote. She’d never have her own concerns. Love and hate hold hands always so it made natural sense that they’d get confused by upset married folk in the wee hours once in a while and a nosebleed or a bruised breast might result. But it just seemed proof that a great foulness was afoot in the world when a no-strings roll in the hay with a stranger led to chipped teeth or cigarette burns on the wrist. …the great name of the Dollys was Milton, and at least two dozen Miltons moved about in Ree’s world. If you named a son Milton it was a decision that attempted to chart the life he’d live before he even stepped into it, for among Dollys the name carried expectations and history. Some names could rise to walk many paths in many directions, but Jessups, Arthurs, Haslams and Miltons were born to walk only the beaten Dolly path to the shadowed place, live and die in keeping with those bloodline customs fiercest held. There is prose of that quality on every page of this lyrical little gem of a novel, and sixteen-year old Ree is one of the strongest and most admirable heroines I’ve ever had the pleasure of meeting. You should meet her, too.